The NES Zapper was a cool little piece of kit back in the day, allowing gaming fans to use a realistic peripheral to enhance their experiences in titles like Duck Hunt, Wild Gunman, and more. As always, though, someone out there has to go and ruin the fun, with one man being caught using the accessory in a shocking criminal offence. The earliest NES Zapper models, originally released back in 1984, were almost entirely grey to fit alongside the NES' colour schemes. Soon after, Nintendo completely changed the design to include bright orange sections, realising that the simplistic grey models could potentially be mistaken for real weapons if they were taken outside. Of course, wrapping the toy in dark tape sadly negates this bright colouring, and that is exactly what happened in this particular case. 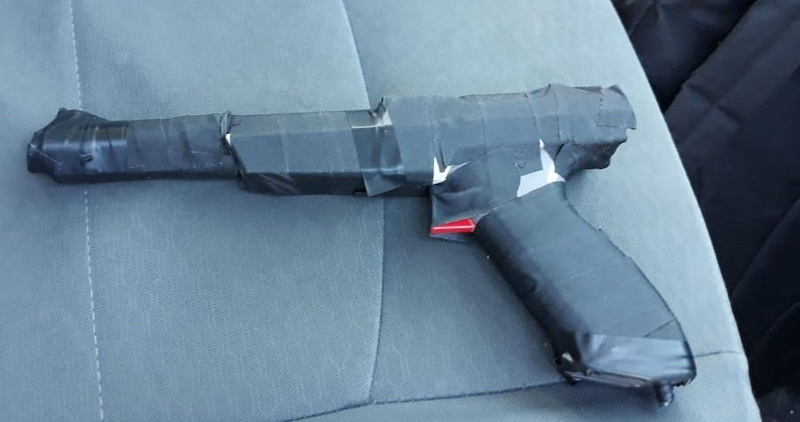 The taped-up weapon was used by a man in Hermosillo, Mexico to rob a bank, with the accessory's usually-bright colouring being almost entirely hidden from view. Bank workers reportedly described the man to local police who, after mounting an operation to find the culprit, managed to track him down and arrest him. The man in question is thought to have potentially been involved in up to 15 other crimes. I'd love for them to do something like this again like give us an inkling gun or an arm cannon. Motion controls are my favorite way to play shooters. Random: Man Uses Disguised NES To A Bank. That zapper is definitely the grey one. It has the red trigger. @Medic_alert was going to say this as well. Tape had nothing to do with hiding orange. Will we see comments from people saying this site is giving people ideas? Wrapping tape over the NES Zapper is how Sega came up with the lightgun design for the Master System. On my project backburner is cleaning a ps2 guncon sprayed completely black. Everyone deserves a second chance right? While I hate robbery at least the guy wouldn't have been able to kill anyone. Good thing he didn't use the Famicom one otherwise he would had been shot to death by the cops yesterday. This reminds me of that one movie on the Syfy channel about werewolves where they used spray painted black Nerf guns with flashlights duct taped to them as scopes. @retro_player_22 I've never seen that before. Did they always look like that in Japan or were they eventually replaced with the international design? You had me for a second, there! No way that is the real item, as sold... right? @Ooyah I wasn't able to find much information on Google but it looks real from what I did find. They don't actually have guns in Japan, so they don't feel bad about exposing children to the concept. That's why so many anime and tv shows and stuff from Japan have guns edited out or replaced with laser blasters for the international versions. @ALinkttPresent @Ooyah That's a real Famicom light gun. In Japan, it came bundle with Wild Gunman as shown below. I too don't know what it's called in Japan though, I just called it the Famicom revolver. @retro_player_22 Wow, that is pretty sweet! The man was apprehended after a shootout with the police. Four ducks were killed during the exchange. Looks like the robber was trying to zap some bank accounts. Am impressively stupid person. What a stupid way to get yourself killed. Even if it didn't happen, it very easily could have. Someone needs to rig up an endless video or gif for this guy's eternal viewing of the Duck Hunt dog laughing. @GauBan i dunno dude. The Menacer was pretty cool looking. Dang! That's a nice one! @Heavyarms55 At least it wasn't a real gun that he coulda used to harm innocents. Silver lining and all that. @Ryzaerian And a dog laughed. I'm not the first person in 35 years to come up with the idea of using a video game gun to commit a crime. I'm sure I've a decade ago somebody using a Sega gun to threaten people, and other guns have been used for other purposes. @ALinkttPresent No, the Japanese version of the Zapper was a forgotten gimmick lost most Nintendo accessories. Nintendo only published three games using it in Japan, and there were three third-party games to use it, for a total of six games. Compared to 14 official games in North America, the only region to get all the light gun games. I'm not sure what to think of that. The real irony is that he didn't need to use or show a fake gun or even any weapon to rob a bank. Just the threat of having a weapon is enough, as bank personnel are trained to cooperate with robbers so as to prevent any violence or harm. That's why you occasionally hear stories about someone robbing a bank by just handing over a note saying "I have a gun". Also, when they are inevitably caught, they potentially face less jail time if the crime is committed without a weapon (even using a fake weapon can incur additional time/charges). One could say the guy was on a Buck Hunt. It was definitely the original gray one he used, you can tell by the areas he missed taping, plus the obvious red trigger. @GauBan Hmm. Didn't know about that? I'll hafta look it up. @ryancraddock Actually Nintendo didn't realize anything it was a law in the states that all toy guns had to be bright Neon colors. @Tasuki that actually wasn't a law until 1992. And it only has to be the muzzle. I have noticed now that all you guns I see are completely neon or clear red now a days. Even cap guns. When I was a kid we would remove the orange things half the time. We only played with them in the woods though so it wasn't ever an issue. This isn't the full story NL. Some witnesses later claimed there was another weapon thrown in a dumpster nearby, described as looking like some sort of explosive. The bomb squad was notified by police about the situation. They shut down every street within a ten block radius. When the bomb expert arrived at the danger zone, he found what appeared to be a vr headset. I hope the government doesn't use this as an excuse to ban our light guns and vr. That would be a major blow to the gaming industry. megatron would've been a better accomplice. There's only one man who could pull this off. He's not the hero we need, just the one we deserve. Whoa, you're back? We missed you. Now you're playing with some dude in the shower!!! @Anti-Matter oh just hush up. Every post you’ve made on this site is more aggravating than the last. Say something positive or don’t say anything at all.